The Knicks are 10-22 and Mike Woodson still has a job. He refuses to call plays and he continues to give J.R. Smith the green light. A couple weeks after Andrea Bargnani took one of the dumbest shots of his career, J.R. Smith followed up by doing the same thing. With 20 seconds left and the SHOT CLOCK OFF, Earl took a three and clanked it. This, after he looked disgusted with Bargnani&apos;s shot. 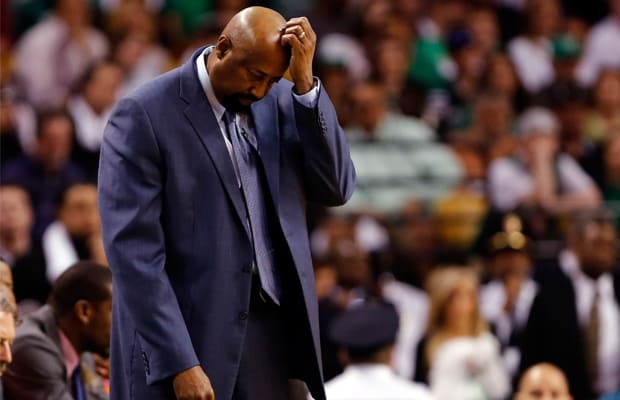 It might be time for Mike Woodson to go. He&apos;s a solid coach but not one that can get a team to the promised land. He makes questionable decisions in the playoffs, uses isolation too much, and locked up against the cot damn Wizards this season. No wonder the Knicks melted down in the postseason the last two years under him. With his job hanging in the balance, we&apos;ve decided to make a half serious list of their coaching candidates. Because at this point anybody would be better than what Coach Woody has to offer. These are the 10 Coaches the Knicks Should Hire.